Guide to island hopping in the Gulf of Thailand | Where Wu At? Here is a guide to the islands in the Gulf of Thailand. So why did I pick the islands in the Gulf of Thailand instead of the more glamourous Koh Phi Phi or Phuket on the Andaman Islands side? Simply said, mother nature. Depending on what time of the year you go, either the east or west side of southern Thailand will experience their monsoon season. On the west coast (or the Andaman Islands), it often rains from April through to October. On the east side where I visited, it rains mostly between September and December. I didn’t have enough time to stay at different beaches on each island so I picked one beach on each island after doing some research in advance. Do research which beaches to stay at depending on what type of experience you want. 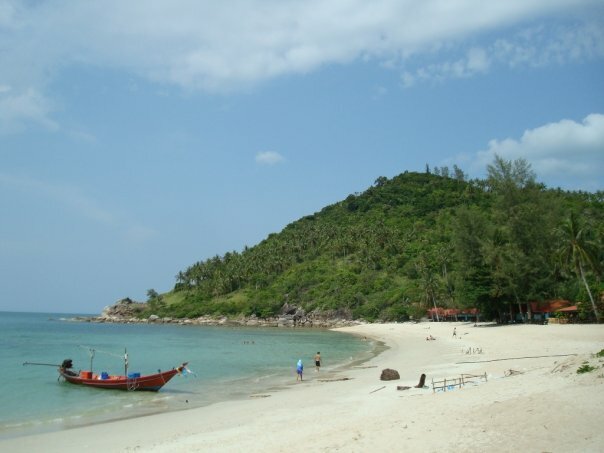 Check out this site on a guide to Thailand’s beaches. With the shear number of beaches and what each have to offer, you can spend weeks on the islands and have plenty of stories to tell your jealous friends back home! Beach: I picked Chaweng Beach because it is the most developed beach on the Koh Samui and I wanted to be able to experience a mix of tourism and seclusion. The beach was perfect – white sand and clear blue water. There’s also enough shade from the palm trees to get away from the strong sun. Accommodation: Jungle Club in Chaweng Beach. I found this place online through sawadee.com and picked it because of it’s location away from the busy beaches of Chaweng. Jungle Club is like a posh resort but at backpacker prices – the grounds are beautiful, well maintained and the staff are super friendly. I stayed in the Jungle Hut which was very new and clean. The restaurant opens out to a breathtaking mountain top view and there are plenty of places to chill (for example, in the gazebos perched on the edge of the mountain complete with plush pillows and lanterns or the sun chairs surrounding the infinity pool on the mountain edge!). The staff are very friendly and welcoming and they definitely go out of their way to make you feel at home. Travelfish.org and sawadee.com have lots of places to stay listed. If you’re looking for more relaxation and peace/quiet, stay away from the main Beach Road area and out of Chaweng Beach where there is a definite party atmosphere. Activities: beach and sun, do I have to say any more? Chaweng Beach is beautiful but more touristy than most beaches. But then again, Koh Samui is more touristy than its neighbouring islands Koh Tao and Koh Phangan. Beach Road, which is the main road that runs behind the beach, is especially busy with many tourist agencies, sunglasses stores, restaurants, bars/cafes and “Armani” suit shops. Word of caution though: I doubt the store “Armane” which sells “Armani” suits is real. Transportation: flew into Koh Samui from Penang, Malaysia via Firefly airlines. A very convenient way to get to the islands from the mainland or from other islands is with Lomprayah High Speed Ferries. This is the most popular company operating between the islands and the mainland. They are very organized and a convenient way to go island hopping. Since Jungle Club is perched on the top of a mountain, a 4×4 jeep is the only mode of transportation from the town below. Within the town itself, it’s very easy to find songthaews, especially along Beach Road. These go short and longer distances and are the cheapest way to get around (cheap as in less than $1). If you don’t feel like finding/bargaining your own transportation, most accommodations can arrange transportation to and from the airport and the ferry dock (to get to other islands). Food: Most resorts and places to stay have their own restaurants which have a variety of Thai and continental cuisine items on their menus (depending on the place) . There are also multiple cafes along Beach Road which serve a mean mango shake. Beach: I highly recommend staying at Bottle Beach for anyone visiting Koh Phangan or the Gulf of Thailand islands for that matter. It is very secluded since it’s only accessible by long tail boat and has a sense of community since everyone knows each other. Walking down the beach, you’ll be greeted by name by locals and tourists alike. As for the beach itself, the water is very shallow so good for wading around but be careful of the rocks. Accommodation: Haad Khuad Resort (or more affectionately called Bottle Beach 3) in Bottle Beach. There are 4 places to stay along the beach – three creatively called Bottle Beach 1, Bottle Beach 2 and..you guessed it…Bottle Beach 3 and are all owned by the same family. The fourth place to stay is Smile Bungalows which is on the west end of the beach. All are clean and have a range of accommodation from thatch huts that almost touch the water to larger 2 bedroom cottages further away from the beach. I picked Haad Khuad Resort just because it was the newest one but walking around, they all seemed the same. Activities: I’m a beach bum so of course, I just relaxed on the beach most days. There’s also another nearby beach which you can hike to but be warned: make sure you stay on the path or else it’s very easy to get lost in the jungle (I did, which in hindsight is a funny story but at the time was pretty scary). You should also have some cash on you because there’s a man who charges 20 Baht to cross through his land on the mountain which the path does. At night in Bottle Beach, it’s a very different story! Each night, there is a poi fire show on the beach with dancers and drunk tourists who think they’re fire dancers. You can also take part of the communal lighting of paper lanterns and drinking out of the communal plastic bucket of liquor (you do get your own straw though, we’re not savages here!). And then there’s the Full Moon Party which Koh Phangan is famous for. I’m not going to go into the details of what this is since I’ve heard and experienced too many crazy unbelievable stories to count so if you don’t know about it, just google it. Transportation: The best way to get to Koh Phangan is via a high speed ferry. Lomprayah (see Transportation section for Koh Samui above) is the most popular choice. You can get around the island either by long tail boat, songthaews, taxis or by scooters (but be careful, the number of tourist deaths per year by scooter accidents is alarming). It all depends on what your budget is and how adventurous you are! Food: All four places to stay on Bottle Beach also have their own restaurant which serve delicious Thai food and ice cold drinks. All the places are about the same in terms of quality of food so my suggestion is to try all 4 places. Also, don’t forget to get an ice cold Singha while you’re lounging on the beach. Beach: I picked Haad Sai Daeng after looking through Travelfish’s guide to accommodation. It is less busy than most of the beaches in Koh Tao and the one thing that attracted me was their close proximity to Shark Island where you can scuba dive with reef sharks. There are only 2 resorts in Haad Sai Daeng so it is very peaceful. Accommodation: Coral View Resort. The resort consists of multiple island huts and villas tucked in a little cove along the water. I stayed in the Traditional Island Hut which was rustic and still very clean but not as spotless as the huts on the other islands. If you have the cash and are sensitive to noises (especially from crickets and geckos), splurge for the villas. The main positive was the dive center – Coral View Divers. The dive instructors are all very friendly and the groups are small so it’s more personalized. In fact, I was the only student with the Dive Master, Robert, who was super nice and patient since it was my first time scuba diving. Activities: Diving, diving, diving! Koh Tao is known as one of the best places in the world to dive so if you have the chance, go diving! Most resorts have their own Dive Center who can arrange everything for you. They offer a variety of courses and dives ranging from those who have never dived before to pro-star divers. If you’re still uneasy going scuba diving, you can also see lots just by snorkeling. Most resorts can either arrange a snorkel trip for you or rent out snorkel gear so you can swim around to your little hearts desire. Transportation: Coral View was very helpful in arranging transportation for me after being herded off the Lomprayah ferry from Koh Phangan. There was a driver waiting for me at the pier holding a sign with my name on it even though I never told them what time I would be arriving. I can’t comment on getting around the island because I mostly stayed in Haad Sai Daeng and got around on foot. Food: Delicious as usual. The green curry at the restaurant inside my resort was amazing! And as always, accompanied by a mango shake. The view from the restaurant also drew in tourists who weren’t even staying at the resort. There are lots of places to eat around the pier in town which serve a variety of food if you’re all Pad Thai-ed out. So there it is, a quick guide to the islands in the Gulf of Thailand! For more information, don’t forget to check out travelfish.org or look through the many travel guidebooks out there (my personal fav is Lonely Planet)! Claud this is awesome! I’m going to Thailand in December and was trying to decide btwn East vs West. This def helps! Thanks travel guru!! Koh Samui is an island off the Southeast coast of Thailand and it epitomizes the natural beauty and quaint island life.